Jampacks are perfect for beginning students and come with "Everything You Need To Get Out and Jam" - guitar, electronic tuner, and a whole lot more. 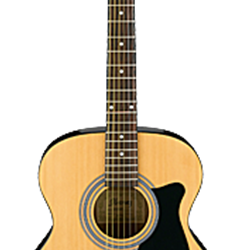 COLOR: NT : Natural High Gloss Finish JAMPACK Includes: VC50NT Grand Concert Acoustic Guitar. Gig Bag. Chromatic Clip-on Tuner. Guitar Strap. Accessory Pouch. Picks.